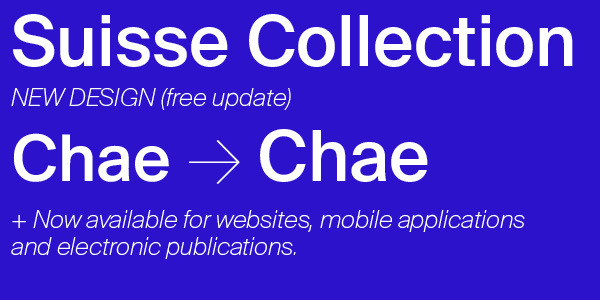 Suisse typeface is updated and available with webfonts, for free! We are contacting you regarding your previous purchase of the Suisse BP typeface on our website. As you maybe already know, we have released a new website including a webfont solution at the end of last year. We also changed the naming: Suisse BP is replaced by the more simple Suisse, allowing you to use both versions at the same time. Our webfonts are manually optimized for ClearType rasterizers and above (DirectWrite), using TrueType hinting. Please send us these informations at update@swisstypefaces.com only and allow us up to 30 days to receive an answer with your coupon to proceed to the free update. This offer is valid until September 30th, 2014 only: after this date, no update request will be accepted. Please do not answer to this e-mail, but follow the instructions described above. We hope you will enjoy the new design possibilities offered with Suisse! You have received this e-mail because you have purchased the Suisse typeface in the past. We hope you found this information about the update offer informative and useful. If you no longer wish to receive informations about the updates and offers around our Suisse collection, use the links at the bottom of this page to unsubscribe. This is not a newsletter: if you want to receive general news about our new releases, please subscribe to our Newsletter on our News page or via your client account.